Say it quickly and say it proud and everyone will think you are Irish today! Happy St. Patricks Day!!! Wishing you day filled of lucky charms, green beer and pots of gold! OH MY EVER LOVE'N IRISH GOD!!! Thanks Cherish and the same to you! And Shandi, coming from someone who is actually Irish and has been there, I am very flattered. Happy St. Patrick's Day! Great, first I had to give up Greek olives and now Lucky Charms. You bring the Mick in me to tears. This is the most I’ve laughed in months. Once again, Squire Mickey the Incontinent, I'm sorry to put you off from such nutrional treats as Lucky Charms and greek olives. But at least I've helped you celebrate your Celtic heretage. 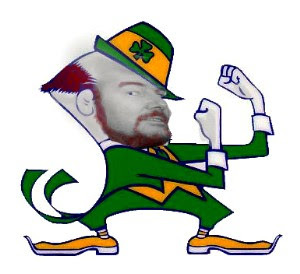 I can only imagine celebrating St. Patrick's Day in Las Vegas (though I did celebrate it one year walking up and down Bourbon Street clutching a bottomless cup of green beer in New Orleans...ahhh..the beads I collected that year). But I digress, Happy St. Patricks Day to you as well! I had to have the wife say it to get the gist of it.....har har har. St Patrick, wasn't he the guy that drove the green out of beer....no....that was snakes....there were snakes in beer?.......oh, forget it, it's to damn complicated.........oh, now I remember......he rid Ireland of Leprachans during the inquisition......right? A good Catholic like you should be very familiar with all of the saints the Michael!